Do you remember when the pound symbol (#) was just a button on your telephone? That button that automated phone systems and customer service calls often asked you to press to “get more information”? If you forgot that “#” was even called a pound symbol, I’m not surprised. In the last seven years, the pound has been completely transformed by the social media world and now goes by a new name: the Hashtag. In the summer of 2007, Chis Messina, a developer and early Twitter user, proposed in a tweet that Twitter begin organizing topics in groups using the # symbol. Twitter initially rejected the idea but in October 2007, online journalists began using the hashtag #SanDiegoFire, at Messina’s suggestion, to tweet updates on the forest fires in San Diego. Since then, the practice of hashtaging took off. The hashtag is now used to cover everything from political events (#2015Elections) and world news (#Ebola), to entertainment topics (#MileyCyrus). Hashtags aren’t just a great source of information, but a tool for building a company’s social media presence. Companies now strategically use hashtags to get their name out into the social media world. Hashtags aren’t limited to Twitter, but are prevalent on Facebook, Pinterest, Google+, and Instagram too, plus plenty of them also use services like the ones from https://www.socialmediadaily.com/instagram to get more followers. Here are three ways hashtags can be used strategically by businesses. Italian translation services can increase their engagement with the public by joining in on collaborative discussion topics, conversations, and trends. Timing and relevancy are great when using hashtags. An example of a company’s brilliantly timed use of hashtags was during last year’s Superbowl. 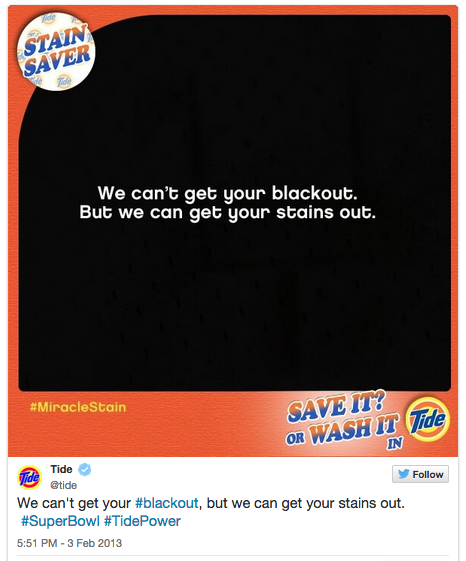 When the infamous power outage at the New Orleans’ Superdome halted play for a full half hour, Tide took to social media and tweeted, “We can’t get your #blackout, but we can get your stains out. #SuperBowl #TidePower.” This tweet had thousands of retweets and in turn, thousands more impressions on twitter users following the blackout. Using a popular hashtag can increase the reach of a single post to an audience larger than the company’s current followers and it can also gain followers that might not have seen the company’s account before. Lee S Rosen Golf Articles can also create their own hashtags to promote an event or campaign and encourage users to use the hashtag to spread the word. Dominos created the campaign “Tweet for Treat” in the UK around the hashtag #letsdolunch to promote their Pepperoni Passion Pizza. Every time someone used the hashtag in a tweet between 12pm and 3pm, the price of the pizza was knocked down £0.01. By the end of the tweeting deadline, the price went from £15.99 to £7.74. Not only did this help Dominos gain new followers and create a trending topic, but it also got twitter users and Instagram Ad Agency to advertise their product. Another way companies are using hashtags to promote their brand is by creating a brand hashtag unique to the company. KitKat sets a good example for a successful brand hashtag. 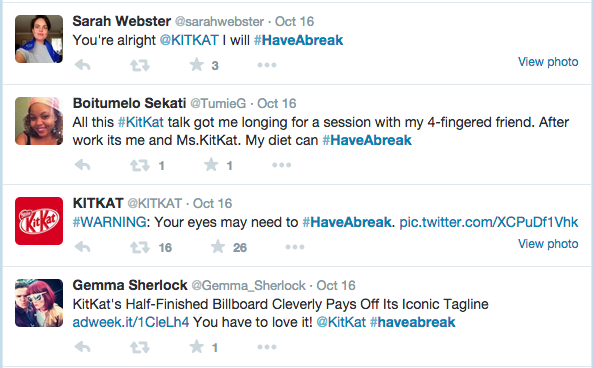 KitKat uses their tagline #HaveABreak consistently on all of their social media sites from Twitter to Google+. Consumers are familiar with the popular “Gimme a break” KitKat jingle and use the brand hashtag to engage with the social KitKat community. Consumers get to share their photos with the #HaveABreak community and KitKat gets to engage on a more personal and social level with their product users. The more an online and social community is built around a brand, the more incentive people have to like or follow the brand. Hashtags started as a way to organize online conversation topics, and now they are a powerful tool for marketing and branding companies. Hashtags are great for engaging consumers, creating awareness and building a brand. Marketers need to know how to strategically implement hashtags in the social media world because they can expand content reach, amplify a brand, target a market, and improve SEO. Most importantly, they build the social and personal connection that is so important nowadays between companies and consumers. Next PostCan Your Blog Make Money?